Math Whiz, Dave, and with Retired Semiconductor Physicist, Now Amateur, John, and then go to the lecture hall where we bumped into Physicist, Author and Docent, John, as well as Hikes A lot, But doesn't take a scope, Bob. Good to see everyone! By the way, I am told there was a great summary write up in this Sunday edition of the OC Register on the event. Speaking of good lecture series, if it is not already on your calendar, you should consider the upcoming 2017 UCI Reines Lecture by Professor Art McDonald on the search for neutrinos, entitled "A Deeper Understanding of the Universe from 1.2 km Underground", at the UCI Barclay Theater, on March 1. Get your free tickets and see you there! Now to the mail. I got a couple of questions from Civil, Civil Engineer Marcello, who asked what software was used in the analysis of the stars and background sky surface brightness and magnitude described in the February 13 post. I use several amateur astronomer software packages for analysis, but mostly use AIP4WIN for star profile and light curve analysis and hope to also start using MPO Canopus for analysis too. AIP4WIN is an inexpensive software package that enables amateurs to do photometry and astrometry on their images. Hope that helps, Marcello. By the way, I see that Marcello's image of the Orion Nebula (M42), taken at the Anza dark sky site, was featured in the February 2017 issue of OC Sirius Astronomer. Congratulations, Marcello, that image looks really neat! Also, that February issue includes the February 5 Palmia Observatory post describing the photo taken of the background stars in the constellation Leo that will be visible during the upcoming August 21 solar eclipse. I got another email from Retired Physicist, Old Dr. Ben, who I meet up regularly at the CSULB physics colloquia, had commented on the February 18 post where I mentioned the Nature magazine article describing the finding of the black hole residing at the center of the globular cluster, 47 Tuc. He pointed out that this was not the first time a black hole had been found in a globular cluster and in fact they might be quite common. Thanks for that, Ben! Yes, it turns out that the textbook I have been using to read up on the nature of globular clusters was published before the black holes in any globular cluster had been found. That textbook, shown below, is still to my amateur way and physicist wannabe way of approaching globular clusters, still a very good textbook for gaining an understanding of globular clusters. I have not found an inexpensive later edition of another book anywhere. 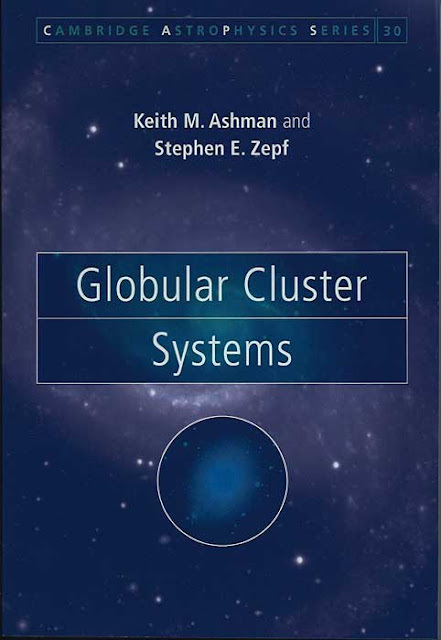 One of the topics I hoped to learn more about by reading this book was the formation and evolution of star clusters, but the authors say that at that time there many interpretations, but no well established or accepted formation or evolution theory for globular clusters. I had hoped that there might be some discussion similar to that given for the formation of stars and solar systems which begins with the collapse of large molecular clouds. I haven't found any reference to dark matter or molecular clouds in my reading of the text so far, so I might have to wait for a better answer. As it turns out, the last three physics colloquia at CSULB have been on the search for dark matter and while there was some discussion about dark matter and dwarf galaxies, I don't recall much discussion about dark matter and globular clusters. But the main thing I found interesting in the physics colloquia, was in a lecture by Dr. Katie Mack, University of Melbourne, Australia. She talked about her research area, which was interesting, but I was most interested in one of her comments about how molecular hydrogen in large gaseous molecular clouds is a key component in the formation of stars and galaxies. I asked her about that comment during our lunchtime meeting and she said that molecular hydrogen is a key component in allowing the cloud to cool down and lose energy by radiation so that gravity can continue the collapse of the cloud to form stars. She had to go to another meeting and I didn't get to follow up on that topic, but separately we know that as a cloud of hydrogen cools down it will transition to molecular hydrogen and cool down further by radiating away the molecular formation energy. Without radiating away the kinetic energy, the molecules in the cloud are moving too fast to allow gravity to continue its collapse of the cloud. But how does the hydrogen molecule cool down further since there are no lower quantum states to fall into? It is not clear what the final answer is, but I have found that in addition to molecular hydrogen, there is a some carbon monoxide molecules in the cloud too and these molecules can radiate energy from rotational quantum states at lower temperature than can molecular hydrogen. So, the whole cooling process is some complicated mixture of energy transfer from hydrogen molecules to carbon monoxide, which through collisions between all the molecules allows the molecular cloud to cool down by radiating away the energy. More to come on that topic as I find out more about it. One of the other topics in the book is the method of establishing the distance to globular clusters and one of the better known methods is use the variable star period and luminosity relationship associated with RR Lyrae variable stars. 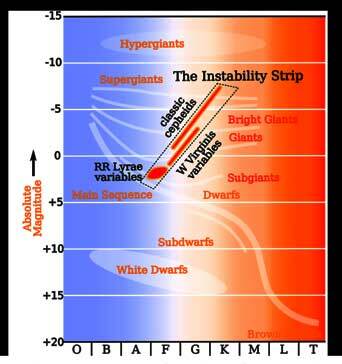 Not knowing much about RR Lyrae stars, a quick search on Wikipedia found the following HR diagram showing where those stars fall. The stars have evolved off the main sequence and having burned up all of their hydrogen fuel in the core, start burning helium. This star life history is on the instability strip, which is home to other types of variable stars, and the resulting variation of star illuminosity with period can be used to estimate the distance to the star. The HR diagram shows how stars evolve and one of their major changes is their color and their color is most easily measured with a spectrometer. Now, I have been interested in making stellar spectral measurements for over a year now and have finally got enough nerve to set up the spectrometer and see if I can actually make a spectrum measurement. The photo below shows the LISA spectrometer attached to the 80mm Lunt Engineering refracting telescope. I chose the smaller 80mm scope because I don't like lugging the bigger scope out for some short term measurements. It is much easier to set up the smaller scope, which weighs only 7-8 pounds, including its carrying case. The spectrometer weights in about the same range. Of course, to operate the spectrometer, I need to carry out a table and laptop computer. The spectrometer software uses the blue colored camera to do tracking and uses the red colored camera to measure the spectrum. So, everything from finding the target star, to tracking some star near the target and keeping the target star focused on the spectrometer slit has just caused me a lot of worry about whether I could get all of these necessary items to work at the same time. Well, the time to try the whole shebang out has finally arrived. Time will tell. We just have to wait as soon as the weather improves. 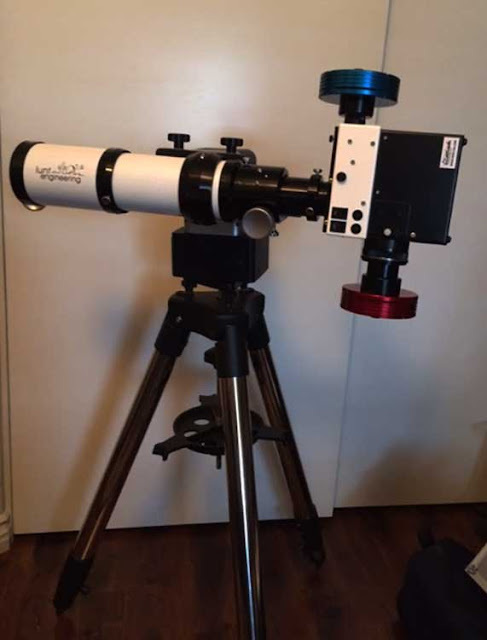 Finally, I should mention an issue that many amateur astronomers are probably all too familiar with and that is the process of mounting accessory devices on telescopes and mounts. What is not seen in the photo above is the v-rail, mounted to the scope, which is then fitted into the mount hold down fixture. Ok, ok, that was pretty straight forward and required just a couple of 1/4 - 20 cap screws to keep the rail attached. Then, I tried to mount my red dot finder on the scope and discovered that the little threaded screws that came with the scope were not long enough to fit everything together. So, it was off to Loews to find some longer screws. I couldn't find that any of the normal #6 or #8 screws would fit. Well, it turns out that those particular threads on the scope, were metric thread and I needed to get some M4-.70 x 12 screws. I didn't think that I would have to have a combination of metric and English threads on the same scope. How about that! Just another lesson that all of us amateurs have to go through. I can't blame not reading the telescope manual for not knowing what thread size was needed here, because in this case the telescope did not have a manual!